This lab is dedicated to the study of human cognition, with an emphasis on attention, memory, and executive control processes. Special equipment includes a 24-channel electroencephalograph (EEG) system and analysis software to study neural activity that underlies our ability to attend and remember information. The Neuroscience Laboratory is equipped for chemical analysis, sectioning, staining, and mounting of animal brain tissue. It contains a Zeiss Axioskop microscope with a digital camera and software for brain analysis. It is currently being used for faculty/student collaborative research investigating areas of the avian brain important in spatial memory. 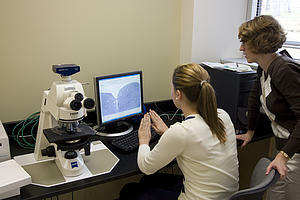 This includes volumetric analysis and immunohistochemical analysis. The laboratory for the investigation of mind, body, and spirit (LIMBS) consists of a network of students, alumni, colleagues, and friends of the laboratory that investigate the psycho-spiritual antecedents, correlates, and outcomes of health. Our primary topic of interest is in forgiveness and health. We conduct research using epidemiological, psychophysiological, and educational paradigms. This facility contains rooms that are configured as animal housing rooms for rats and wild birds. 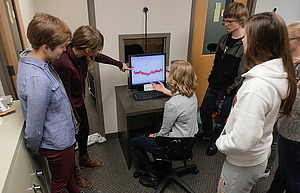 The facility also has observation rooms used for animal behavior and cognition research conducted by faculty and students. 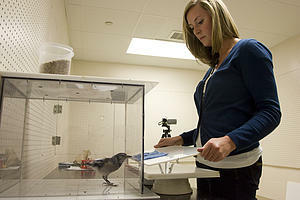 Current research focuses on avian cognition. Ten soundproof operant laboratory rooms are each equipped with Lafayette operant chambers. Software allows for control and monitoring of the ten environments from a central instructor's console. 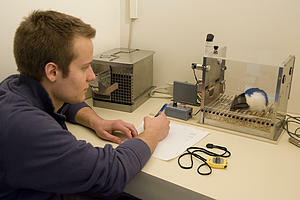 This laboratory is used for the Learning and Behavior laboratory where students study conditioning in rats. The test library is a controlled-access facility housing a variety of proprietary and research tests. It is used by students taking the course in Psychological Tests and Measurement, but also by faculty and students in their independent research. This facility has computers with both word processing and data analysis software. It is for use by psychology students working on class assignments, collaborative research with professors, or their own independent research. The Evolutionary Psychology Laboratory applies the principles of Darwinian natural and sexual selection to the study of the human mind. The working assumption of the laboratory is that the mind evolved to solve recurrent survival and reproduction problems in the ancestral environment. Recent efforts in the laboratory have focused on family investment dynamics, facial attractiveness, and basic attachment process.